The United States federal government began levying revenue taxes back in 1791 with a tax on distilled spirits. Soon after, other items such as carriages, refined sugar and snuff were also taxed. The records that came from these taxes are an overlooked resource for genealogists. 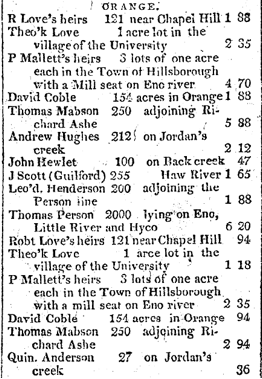 I first discovered this tax when looking in early 19th century Raleigh NC newspapers for items which the Wake County Genealogical Society might abstract for its journal. I came across a whole page titled "Direct Tax of 1815 and 1816" which was repeated in several editions of the newspaper. And, though it was a Raleigh newspaper, the lists of property to be sold for unpaid taxes covered the entire state of North Carolina, organized by county with the names of the taxable persons, description of property and amount payable listed. As you can imagine, it made me very curious to learn more about this tax. This particular tax was especially valuable for Wake County because the earliest deed books and the 1810 and 1820 censuses have been lost. Now that you have a taste for what you might learn from early Federal tax records, let's talk a bit about Federal Direct taxes collected from the 1790s through the Civil War. History: Federal Government began levying internal taxes for revenue purposes with tax on distilled spirits (1 Stat. 202), March 3, 1791. There followed taxes on carriages, retail dealers in liquor, auctioned property, and refined sugar and snuff, 1794; snuff mills, 1795; legal instruments, bonds, and deeds, 1797; and real property, 1798 ... Federal tax collectors were first authorized by the Direct Tax Act (1 Stat. 599), July 14, 1798 ... repeal of all internal taxes by an act of April 6, 1802 (2 Stat. 149), effective upon the collection of all taxes due. Though I could find news items about this tax in the Raleigh newspapers, no actual lists of delinquent taxpayers (as we saw for 1812) were found. A check of 18th century newspapers in the NC digital Newspaper Archives collection showed entries in the Wilmington Gazette about the Direct Tax in the early 1800-1805 time period which talked about the tax, where it was being collected and other details. 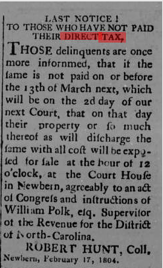 This notice appeared in 1804 which suggests that it took many years to collect this tax, at least in North Carolina. To finance the War of 1812, new internal revenue taxes were imposed, by acts of July 24, 1813 (3 Stat. 35, 40, 42, 44), on sugar, carriages, distillers, and auction sales; followed by acts of August 2, 1813 (3 Stat. 53, 72, 77), imposing direct taxes on property, license taxes on liquor dealers and retailers of imported goods, and stamp taxes ... the repeal, effective December 31, 1817, of all internal taxes, by an act of December 23, 1817 (3 Stat. 401). In the Raleigh, North Carolina newspaper the earliest entry for non-payers I found was late in 1814. By 1818, such lists, covering the state, were taking up to an entire page of the various newspapers. With the repeal of the prior tax law in 1817, no Federal Direct taxes were instituted until once again the U.S. was embroiled in a conflict, the Civil War, and financing was need. The direct tax authorized by an act of August 5, 1861 (12 Stat. 294), placed a quota on each state, including those in rebellion against the United States ... 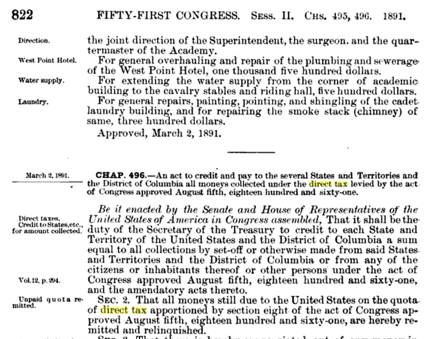 The direct tax commissions were discontinued in 1870, but collection of unpaid taxes continued (under district internal revenue collectors) until 1888. Interestingly, we get a two-for-one element with the Civil War era tax because in March 2, 1891, the tax was essentially repealed and collected monies credited back to those states (and then individuals) that paid. For select North Carolina counties books survive which reflect both those who paid this federal direct tax and then those (indicated in red) who received a refund in the 1890s. These records are very helpful with filling in gaps created by the loss of most of the 1890 census. Since the tax was originally collected in the 1865/1866 time period, it also tells you who paid it in the immediate post war time period filling a gap between the 1860 and 1870 censuses. Tax records (state and Federal) can really give you a slice of life perspective on a person and a community. I often say that a census enumerator may miss people and the tax man always seemed to be a bit more diligent in "his" efforts to document both those from whom taxes were collected and those who couldn't or didn't pay. Recognize that the collecting of taxes did not occur instantaneously. Additionally, determining who legitimately was liable for such taxes and did not pay them also took time. Check for several years after the year in which the tax was instituted. For example, the newspaper article about the Direct Tax of 1815 & 1816 was published in June 1818. 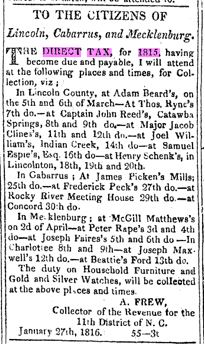 This advertisement shows a designated tax collector setting times and places for the 11th district in 1816. Fox, Cynthia G. "Income Tax Records of the Civil War Years," Prologue Magazine, Winter 1986, Vol. 18, No. 4.